Like different Filipino dishes there are many ways to cook this Pochero, some use baked beans instead of chickpeas, others use potatoes instead of sweet potatoes and other opt for cabbage instead of bok choy but one thing remains it’s basically a tomato based stew of beef or chicken meat cooked with chorizo, some sort of beans, a starchy root crop and vegetable greens. 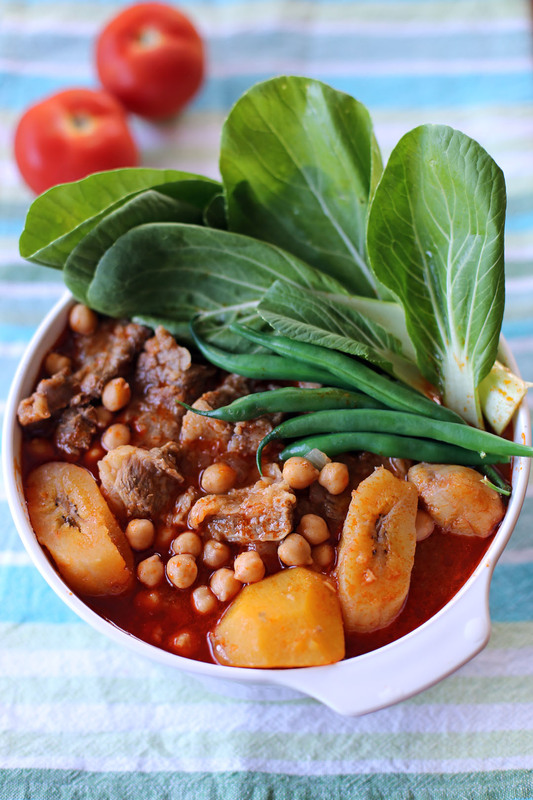 The name “puchero” is a Spanish word that means “stew pot”, having said that this dish originally came from Spain and is now prepared in countries they had colonized like Mexico, Argentina, Colombia, Paraguay, Uruguay and Philippines. Though they exist on the named countries the preparation is quite different as it was adjusted to the local ingredients available in the country. This dish was nearly a staple during my childhood, I remember my mom used to make this a lot. She sometimes use chicken and sometimes beef but she never forgets to use bananas. We also use potatoes before but my wife introduced me the version that uses sweet potatoes so the recipe below is a combination of the recipe I grew up with and the recipe my wife grew up with. The result is a combination of the best ingredients from both recipes. In a pot add oil then sauté garlic and onions. Add the chorizo and cook for 2 minutes. Add the beef, brown the sides then pour the beef stock. Top it up with water until meat is barely covered then bring to a boil. Simmer in low heat for 1 hour. Add the saba bananas and tomato paste and continue to simmer for 15 minutes. Add the sweet potatoes then continue to simmer for 10 minutes. Add the French beans then continue to simmer for 5 minutes. Season with fish sauce and freshly ground black pepper then add the chickpeas and bok choy, turn off heat then cover for 5 minutes to cook vegetables with residual heat. Serve with rice. Some pochero are soupy some are saucy, adjust the tomato paste content depending on the richness and consistency you want. Looks like a hearty and delicious stew. Love visiting your blog Raymund, I learn so much. Cant wait to try this beauty. I will certainly make this very very soon. Thank you for the recipes you share. Mmm – love the look of this – great winter dish – will tuck it away for a few weeks for when the winter gets a bit cooler – thanks Raymund. Gorgeous! Bet this goes well with rice. 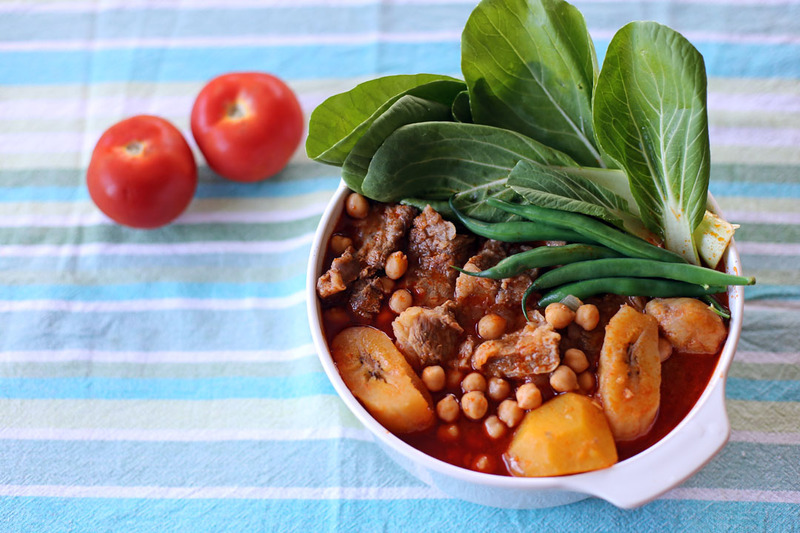 Well, this is a first…beef, chickpeas and bananas. Interesting combination. Looks delicious!